MIAMI (Thursday, May 24, 2018) – The Business Intelligence Group today announced that it has awarded The Revenue Optimization Companies (T-ROC) a Best Places to Work in its 2018 business award program. The organization sought to identify companies that are actively working to improve performance through efforts that help their employees accelerate their careers, knowledge and performance. The Business Intelligence Group honored 28 companies in a program that was solely determined by the employees themselves. T-ROC was one of two winners in the Large Business category. Other categories included Global Enterprise, Multi-national Enterprise, Medium, Small and other size businesses. T-ROC enables clients around the world to fulfill all of their sales performance needs with solutions that cover: in and out-of-store sales performance management, real-time field reporting and business intelligence, full-service customer experience analysis, managed IT services and much more. T-ROC’s services can be used independently but are most effective when used together. All of T-ROC’s solutions are designed to increase sales and reduce costs through the power of people and technology. To learn more about The Revenue Optimization Companies (T-ROC), visit www.trocglobal.com. Follow T-ROC on Twitter, Facebook, Instagram and LinkedIn. MIAMI (May 2, 2018) – Brett Beveridge, CEO and founder of The Revenue Optimization Companies (T-ROC), was named the winner of a Gold Stevie® Award in the Entrepreneur of the Year – Retail category for The 16th Annual American Business Awards® today. More than 3,700 nominations from organizations of all sizes and in virtually every industry were submitted this year for consideration in a wide range of categories including Startup of the Year, Executive of the Year, Best New Product or Service of the Year, Marketing Campaign of the Year, Live Event of the Year, and App of the Year, among others. More than 200 professionals worldwide participated in the judging process to select this year’s Stevie Award winners. Today we’d like to introduce you to Brett Beveridge. Brett, let’s start with your story. We’d love to hear how you got started and how the journey has been so far. During my senior year at the University of Miami in 1989, my friend and I started selling cell phones out of the back of a van. We would literally drive around and station ourselves in parking lots and businesses to sell cell phones, which were just becoming popular. In less than a year, we opened a retail store that became the largest independent mobile wireless retailer in the country at that time. Within seven years, my partners and I took that company public and sold it to Nextel. Start-ups felt natural to me, and I decided to keep going. During my time in the retail industry, I recognized many problems, particularly at big-box retailers where consultative sales people aren’t equipped to help customers understand and choose the latest in technology such as cell phones and rate plans. That sparked the idea to start The Revenue Optimization Companies (T-ROC), a parent company that houses four, stand-alone companies that each focus on a specific retail solution. I’ve now founded ten award-winning companies, and we assist the world’s most reputable companies and brands such as Apple, Walmart, T-Mobile, Comcast and many more. I think any entrepreneur will tell you that the road to success is never easy — you’re always going to have struggles and that’s how you learn, evolve and become better. I made the risky decision from the very beginning to stay independent and use my own money to start companies, even personally guaranteeing heavy bank loans because I believed in what we were doing. My first project came in 2007 — one year before the recession hit — so it was a grueling balancing act of gaining customers, losing customers and working very hard to find new customers. During that time, I didn’t take a paycheck, kept the company lean, and worked hard for new sales opportunities. I learned to speak “recession” language and landed clients by saving them money, while offering them more efficient ways to operate. Alright – so let’s talk business. Tell us about The Revenue Optimization Companies – what should we know? The Revenue Optimization Companies (T-ROC) houses four, stand-alone companies that each focus on a specific retail solution. We spend every waking hour finding ways to dramatically grow your revenue and reduce your costs through a unique combination of people and innovative technology. We’re best known for selling complicated stuff that we make easy for consumers to understand. I think of it like a doctor prescribing the best medicine for a patient: We prescribe solutions, which are the best technologies for your personal needs. When it comes to what sets us apart, unlike other competitors, we own and operate our stores, which keeps us sharp and on top of what’s happening in our space. This allows us to help other companies run their stores more efficiently too. One of my proudest accomplishments is that four companies that I’ve founded have now been recognized on the Inc. 500/5000 annual list of the fastest growing private companies a total of six times, including two companies in 2016. South Florida Business Journal has also recognized T-ROC as one of the best places to work three times, and I’m honored that our people love working with us. We’ve promoted more than a 110 people this year, with more to come! Businesses like mine can be started anywhere because we are servicing national clients on a national basis. If you’re starting a company here, my advice is to make sure you can attract the right talent at the leadership level. While Miami does not have an overage of large businesses like New York, Los Angeles or Atlanta, our city does have a lot of support and ingredients for startups and entrepreneurs. The UM Life Science & Technology Park has incubators in it and there are community centers where inspiring entrepreneurs or startups can exchange ideas, network and create partnerships. Miami is a vibrant breeding ground for different talents, cultures and points of view, which leads to entrepreneurship. In the business of celebrating mold-breakers, EY announced its list of 2017 U.S. regional and category winners in its 31stannual Entrepreneur of the Year® awards. In total, 35 U.S. members of YPO made the list with Asif Ramji, President and CEO of Paymetric in Atlanta, Georgia, USA, taking top honors as EY Entrepreneur of the Year 2017 US in the Financial Services category. EY is YPO’s Strategic Learning Advisor. “I am honored to receive this prestigious Entrepreneur of the Year national award by EY,” says Ramji who began with Paymetric in 2009 as the Chief Revenue Officer when the company was losing millions. “I want to share this recognition with the Paymetric team for all of the innovative work that is done each day.” Ramji changed Paymetric’s business model from licensed software to a cloud-based software-as-a-service (SaaS) subscription. Within 18 months, Paymetric transformed every client from licensed software purchaser to monthly recurring subscriber — generating monthly recurring revenue. The company’s client base tripled and it began to turn a profit. Based in Coral Gables, Florida,The Revenue Optimization Companies (T-ROC) enables its clients to fulfill their sales performance needs through a variety of retail sales solutions. It has seen 264% growth over the last three years. With its mainly millennial workforce, T-ROC found Workplace to be the perfect solution to connect its employees: it’s easy to implement, requires no training and uses the Facebook platform young professionals are familiar with. Now everyone at T-ROC is using Workplace—from the CEO, to administrative assistants. Specifically, Work Chat has become integral to its sales operations and enablement. It instantly connects employees through mobile or desktop to get answers, send files, or conduct video calls. “When sales staff working independently in the field need answers fast, Work Chat is their lifeline,” said Page. The impact of Work Chat on T-ROC’s sales team can be seen across the entire company’s operations. The organization has become more agile, allowing for spontaneous and lively dialogue on new ideas, products and campaigns that bring employees closer. A national team of T-ROC employees represent a large wireless carrier advocating their brand while supporting and training their big box retail stores. Part of the job requires setting up displays for the brands they’re representing. To encourage quality setup, T-ROC leadership devised an impromptu contest, asking employees to share a photo of their display in a Workplace Group. The employee with the best display would win a gift card. The contest was executed in 48 hours, eliciting comments, gif-filled responses, and hundreds of reactions. This dynamic experience would not have been possible with email. With more than 80% of employees using Workplace and 97% using Work Chat, Workplace has helped T-ROC remain agile, and increase productivity and knowledge sharing between its sales teams. Next, T-ROC plans to explore integrations with Workplace bots to automate and make processes efficient. In particular, it wants to use a “thanks bot” to make employee recognition easier and transparent. Congratulations to all the companies that made our Fastest-Growing 50 Companies lists. The companies recognized showed sustained revenue growth from 2014 to 2016, and are ranked by percent growth of revenue in that time span. They are ranked in two lists: 25 companies with over $25 million in 2016 revenue and 25 with under $25 million in 2016 revenue. The list featuring companies with over $25 million in revenue boasted one company that actually grew to over $1 billion. This group was once again led by construction or construction-related businesses, which had eight representatives, followed by technology companies with four and staffing agencies with three. Last year, this List featured 11 companies from the construction industry. Hayes Locums LLC is the youngest company on the List, founded in 2012, while City National Bank is the oldest (1946), but it’s still growing. On the list that includes companies with under $25 million in revenue, the technology sector placed eight companies. Alturna-Tech led this group – but not only this group. The company topped the list of 50 companies, due to its impressive growth percentage. Founded in 2013 and the newest of those on both lists, the IT solutions provider appears to be rocketing to stardom. Kabat, Schertzer, De La Torre, Taraboulos & Co., an accounting firm based in Miami, has been servicing clients since 1976 and has been around longer than any of the other companies listed on the under $25 million list. Aside from the tech companies, this list shows some diversity in that we have engineering companies, accounting firms and general contractors mixed in with specialty food importers, a landscaping company and a gourmet spice producer/processor. This illustrates that our South Florida business community is as diverse as it is robust. The South Florida Fast 50 companies were feted at an August 17 awards ceremony at Miami’s Jungle Island. The event was sponsored by BankUnited, Comcast Business and Daskal Bolton. Associate sponsors were the Greater Miami Chamber of Commerce and Oasis Outsourcing. At a time when many are proclaiming the death of traditional retail stores, Brett Beveridge’s company sees it as an opportunity for growth. Beveridge is the CEO of Revenue Optimization Companies, a retail services company that advises retailers on how to lower costs and increase revenues. It has four divisions, each focused on a different retail solution. Revenues for the company increased 174 percent between 2014 and 2016, and totaled $62.88 million in 2016. The company currently has more than 2,000 full-time employees, Beveridge said. One segment of the Coral Gables-based company places T-ROC sales teams inside existing retail stores, such as Walmart, to help sell technology products, such as mobile phones and home security. Another area of focus is gathering and analyzing metrics for its clients on consumers through mystery shopping, customer surveys and compliance audits. Beveridge, who previously founded specialty wireless retailer Let’s Talk Wireless & Cellular, said he noticed from past experience that big box-retailers oftentimes were not adept at selling electronic or high-tech products and services. His new company helps solve that challenge by focusing on individual customers’ needs and truly understanding the technology behind the product, he said. Beveridge said that he sees continued growth in the technology side of retail. “There are a lot of retailers that are struggling and our companies are set to drive revenues and decrease costs,” Beveridge said. MIAMI (August 2017) – Inc. magazine has ranked The Revenue Optimization Companies (T-ROC) No. 2319 and its subsidiary company, The Retail Outsource, No. 958 on its 36th annual Inc. 5000, the most prestigious ranking of the nation’s fastest-growing private companies. The lists represent a unique look at the most successful companies within the American economy’s most dynamic segment — its independent small businesses. Companies such as Microsoft, Dell, Domino’s Pizza, Pandora, Timberland, LinkedIn, Yelp, Zillow, and many other well-known names gained their first national exposure as honorees of the Inc. 5000. The Retail Outsource ranked #25 in Top Miami companies and is a 5-Time Inc. 5000 honoree. To learn more about T-ROC, visit www.trocglobal.com or follow the company on Facebook, Twitter and LinkedIn. To learn more about The Retail Outsource, visit www.theretailoutsource.com. For more information on Inc. and the Inc. 5000 Conference, visit http://conference.inc.com. 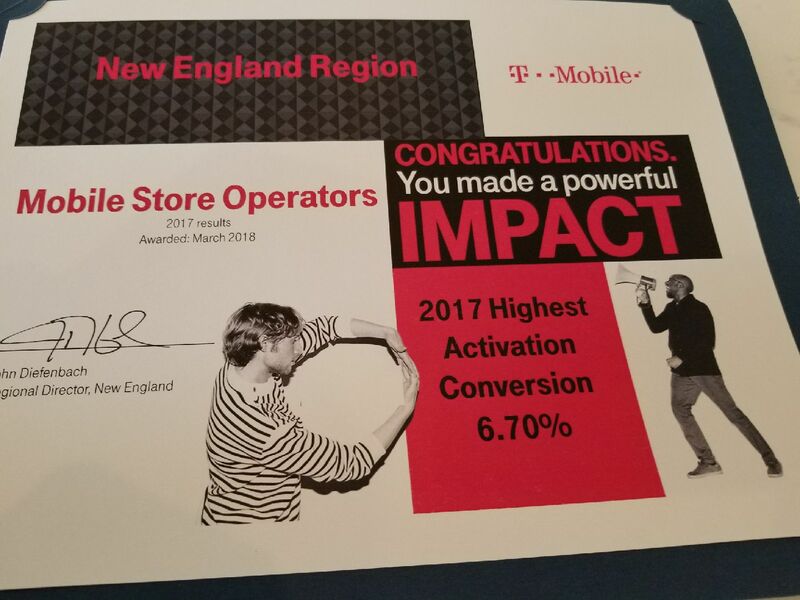 En pleno desafío del clima socioeconómico del País, T-Mobile Puerto Rico unió esfuerzos con su socio de negocio Mobile Store Operators (MSO) para hacer realidad la apertura de la primera tienda T-Mobile en Cidra. Localizada en la Carretera PR 172 en Plaza Cidra, la apertura de la tienda supone una inversión de aproximadamente $400,000 y la creación de cerca de 25 empleos directos, indirectos e inducidos. Es la primera tienda T-Mobile en Cidra y la #11 operada por MSO en Puerto Rico con el alcance de servir a clientes de pueblos vecinos como Aguas Buenas, Aibonito, Comerío, Caguas y Cayey. “Es un orgullo llegar a Cidra y servir a nuestros clientes del centro de la Isla. Con cada apertura no sólo acercamos nuestros productos y servicios de calidad a más personas; también estimulamos la economía local mediante la inversión, la creación de empleos y la actividad económica. El apoyo de nuestros clientes y la confianza que ellos depositan en nuestra marca son las razones principales que motivan nuestro plan de crecimiento en el mercado, siempre a favor de Puerto Rico”, comentó Buddy White, gerente general de MSO. La nueva tienda T-Mobile en Cidra cuenta con un espacio de 1,800 pies cuadrados. Su diseño moderno provee áreas más cómodas y a la misma vez un servicio personalizado para los clientes.